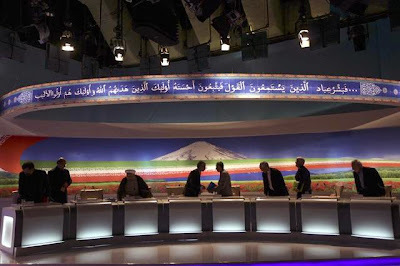 Iran’s eight presidential candidates prepare to leave the set after their second of three televised debates in Tehran, Wednesday, June 5, 2013. The Iranian presidential election, scheduled for June 14, is only one week away. As candidates jockey for endorsements, support and, ultimately, votes, a surprising frontrunner has emerged, according to a new university poll cited by Iranian media outlet Aftab News. Hassan Rouhani, a former nuclear negotiator and current Secretary of Iran’s Supreme National Security Council, is now leading the pack of eight candidates with 23.3%. His closest competition is Tehran mayor Mohammad Bagher Ghalibaf, who garnered 18.4% in the survey, while reformist Mohammad Reza Aref stood at 14.3% and principlist Saeed Jalili – once widely considered the clear favorite – at a mere 7.5%. Rouhani, a centrist in Iranian politics, is not only close to both former presidents Mohammad Khatami and Akbar Hashemi Rafsanjani in whose administrations he served, but also a trusted representative of Ayatollah Ali Khamenei, Iran’s head of state. A former parliamentarian, he holds positions on both the Assembly of Experts and the Expediency Council and is president of the Center for Strategic Research, an establishment Iranian think tank. This final week of campaigning is sure to bring more sniping and more surprises. The third and final debate, which focuses on foreign policy, will take place today, Friday June 7. Former Muftah editor Daniel Tavana, currently a research associate at the Project on Middle East Democracy (POMED), has put together a comprehensive primer on the upcoming presidential election, detailing the electoral processes, candidates’ platforms, pre-election political atmosphere in Iran, as well as areas of potential concern, including the curtailing of press freedom, intimidation, and censorship. In other, perhaps more important news, the Iranian national soccer team defeated Qatar 1-0 in an important World Cup qualifying match on June 4. The single goal was scored by striker Rez Ghoochannejhad in the 66th minute off an assist by midfielder Mojtaba Jabari. Next up, Iran plays Lebanon at Azadi Stadium in Tehran on June 11, just three days before the election. For more coverage of how soccer and politics often collide in Iran, read Holly Dagres’ recent report, published by Muftah earlier this week. Reza Ghoochannejad, right, and Mohammad Raza celebrate at the Al-Sadd stadium in Doha on, Tuesday, June 4, 2013. I always respected your informed critical writings on Iran, but since you are the editor for the Iran pages I can’t understand how Dr Sahimi can get a free pass from you to make many unsubstantiated claims without presenting a single evidence to back his claims and have his (at best just a) guess work published in Muftah. I stopped reading this latest article of Dr. Sahimi (who I know was a strong supporter of Green movement) after I could not find out whom and where his sources were and how all these can be substantiated with some sort of evidence. At a minimum Dr. Sahimi should have fallowed the model of NYT’s David Sanger and throw in a few anonymous sources since here in the west we now are well tamed to accept the practice. Like many other expatriate Iranians ideologically he is too biased to be reliable writing on internal Iranian politics.